I thought I'd follow up our "Things We Miss" post by talking about some of the things back "home" that we really don't miss, so as not to give people the impression that we're in the throes of total California withdrawal and in a constant state of rolling around in fetal position pining for the Bay Area. Public transit in the Bay Area is a joke, which is ironic given how "progressive" and generally "with-it" its cities and greater metropolitan area purport to be. San Francisco's Muni is a horridly inefficient mess with frequently late busses and epic waits at the bus stop. The East Bay's AC-Transit is equally appalling. For both, it's all too common to wait 25 minutes for a bus only to see two of the same line approaching, one right behind the other. Of course the one in front will be packed sardine-like with people, while the one behind it will be virtually empty. When I worked at UC Press in downtown Berkeley it took an hour to ride the bus from my apartment to work, whereas when I rode my bike (which is how I got to work during my last 3 years there), I'd get there in ~30 minutes. BART is decent as far as getting you from one town to the next, across the bay, or from one end of the city to the other, but it's become increasingly pricey, not to mention that at some stations, if you miss your train you're in for a 15+ minute wait. And the fact that at the time of writing BART still doesn't extend all the way around the Bay and through San Jose is genuinely perplexing. Thankfully, Bratislava's system of trams and busses is quite reliable. The trams and busses will get you just about anywhere you need to go, and they usually seem to be on time - I've rarely had to wait longer than ~7 minutes. It's not the best public transit system; few systems can top Paris' super efficient web of metro lines, to name one example. But for a city the size of Bratislava, its system seems to work well, and having relied solely on public transit since moving here, we have few complaints. I particularly dig the old red Communist-era trams, just because they look so, well... old, red, and Communist. Even our friend Chris says that Bratislava's public transit meets his "German standards", which is definitely saying something. One of Bratislava's old Communist-era trams. Much more reliable than Muni or AC-Transit. 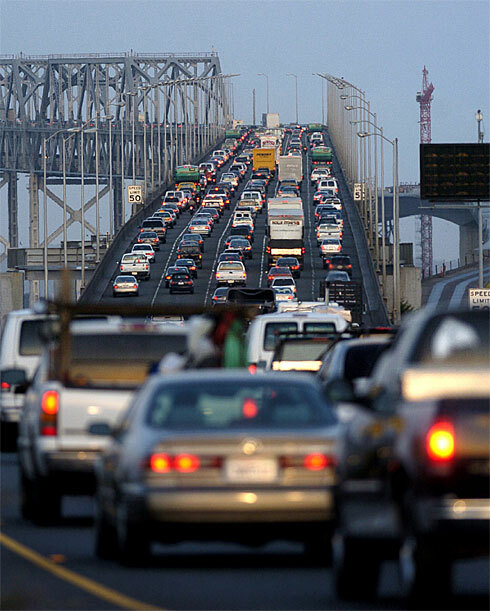 While Terezia actually does miss her car, she doesn't miss sitting in Bay Area traffic, which consistently ranks among the worst in the US (sometimes in the top three, along with LA and NYC). Rush hour traffic in Bratislava, particularly on the freeways on the way into the city, is equally brutal, but since we're living in the city, we never have to deal with it. scenes like this one bit. the day when people who know better simply do not drive into SF. I have nothing against driving, per se, but for me not having a car has been liberating. For one, it's nice not to have to worry about hemorrhaging money for gas (especially in Europe where it's so much more expensive), or monthly insurance payments, or even routine maintenance or repairs. It's thoroughly awesome never to have to even think about parking. Also, not driving is obviously better for the environment. I love that where we live there are several grocery stores which are walking distance from our place (hell, we're practically right next door to a Tesco), and many of the tram and bus lines are very close, so there has really been no practical need for a car. Contrast that with the Bay Area, where running errands or shopping for groceries was infinitely easier with a car, particularly given how lousy the public transportation was and how spread out things tended to be. Of course having a car might make it easier to explore other parts of Slovakia that we still have not had the chance to visit, like Orava, the High Tatras, or Slovensky Raj, to name a few, but I suppose we'll just have to borrow Terezia's parents' car now and then. There's a famous quote that's commonly attributed to Mark Twain: "The coldest winter I ever spent was a summer in San Francisco." Anyone who has lived in or near San Francisco long enough knows exactly what Twain was talking about. Westerly winds that regularly hit the coast from the Pacific frequently bring with them a dense layer of fog, and it seems to happen most frequently during the summer. It's actually quite beautiful to see the thick white blanket of fog cascading over San Francisco's hills and through the Golden Gate, before quickly heading straight across the bay to smother Berkeley and Oakland, like something out of a cheesy horror flick. But having to live under it for days on end in the middle of summer is deeply unpleasant. This occurs pretty routinely most days of the week in the early evening. While it does usually mean that any heat waves are short-lived, it also means that half the summer is spent under a bleak, frigid, grey canopy of wrist-slitting sadness and gloom. Sometimes you can go as long as a week or more without so much as catching even a single, quick, fleeting glimpse of the sun. Planning outdoor activities is always tricky because you never know if the weather will be bright, sunny, and warm (i.e. - summery), or so depressingly overcast that all you want to do is stay home and cry. Don't get me wrong, the summer weather here in Bratislava has been freakishly weird and totally unpredictable. But at least there seems to be quite a lot more sun and heat (Terezia would say too much, as we've had weeks that were so suffocatingly sweltering and humid that we felt like we were drenched in sweat the entire time). It's nice to have a summer that at least feels like summer most of the time. 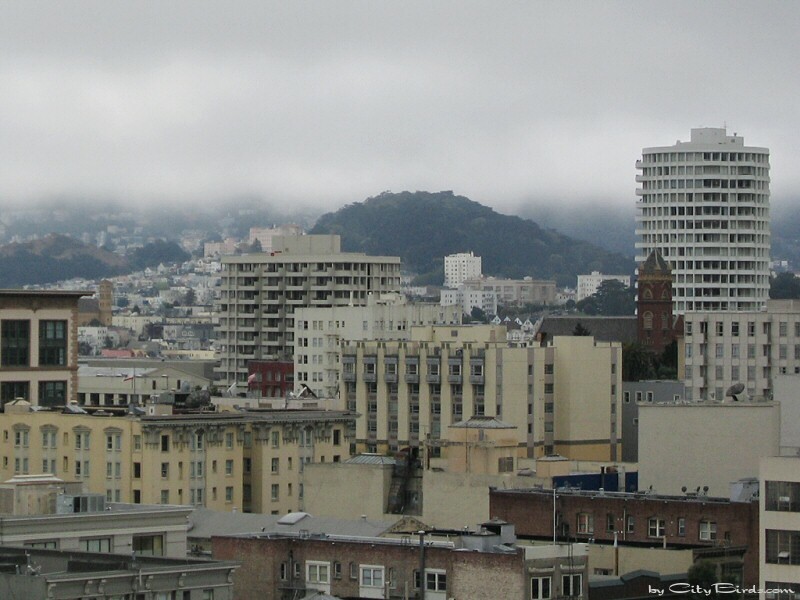 The Bay Area's mild climate barely even has what people from countries like Slovakia would call seasonal change. Seasons change very gradually and reluctantly in much of California. Just when you think that fall has fully arrived, you'll find yourself on Thanksgiving day with 79 degree fahrenheit (26 celsius) weather. Maybe it'll feel appropriately cold and wintery on Christmas, or maybe it'll be bright, sunny, and 70 (21 celsius) degrees - exactly how you wanted it to be back in the summer when it was instead depressing, cold, and grey. In Slovakia, fall announces itself the way it does on the east coast in the US. A monopoly of deciduous trees turns yellow and orange all at once, and then those lush green forests that looked so nice throughout the summer soon turn brown, grey and damp until they become coated in snow. Winter here is the real thing: snow, plenty of days or weeks that are below freezing, and totally deserted city streets, although I should admit that it gets much colder in the eastern part of the country; Bratislava's winters are considered to be comparatively mild, even though they're infinitely more intense than the Bay Area's lame excuse for winter. And when winter finally recedes and spring moves in (this year that really didn't happen until early April), you really gain a newfound appreciation for things like sunshine and warmth. Bratislava getting its first dusting of snow last winter. A real winter in Podrecany. It was obviously tremendously difficult for Terezia to be half way around the world from her family all those years. Sure, she traveled back home when she could, and her parents came out to visit her a few times, but the separation was not fun. In fact, one of Terezia's primary motivations for moving back was to be closer to her family and spend more time with them. We're currently ~2.5 hours away from her parents' place by car, and 4 hours away by train, both of which clearly beat an exorbitant and epic transatlantic flight. We spend the weekend at Terezia's parents' house once a month, and we try to hang out with Terezia's awesome cousin Ludka and her boyfriend Chris (who live in Bratislava) when we can. I've mentioned this before but it's incredibly awesome to be able to hop on the train and get to Budapest in 2.5 hours, or Prague in 4. 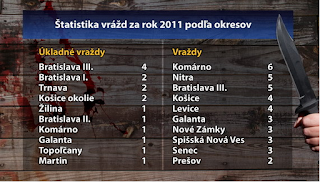 Italy is but an hour long plane ride away, while Croatia is supposedly a 7-8 hour drive, at least to Istria. It's nice to be able to show up at these places without feeling jet-lagged after a brutal 12 hour flight. It also means some of these areas can be explored on shorter get-aways, and not crammed into what would be part of a longer 2-3 week vacation. Plus, going to Prague or Budapest is just plain more exciting than going to LA or Portland, Oregon (nothing against those fine cities, but you know...). 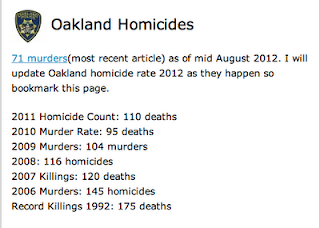 A common trope about Oakland is that because of its history of gang-related violence, the entire city must be an uninhabitable, crime-ridden war zone full of drive-by shootings and zombie-esque crackheads. 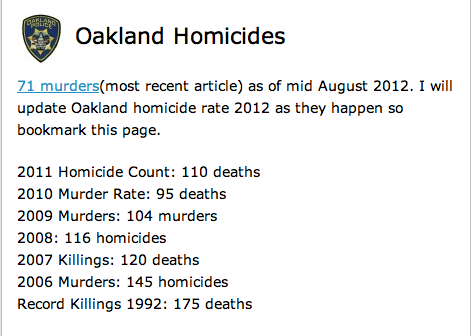 To be sure, there are areas of Oakland that kind of live up to that reputation, particularly parts of East and West Oakland. 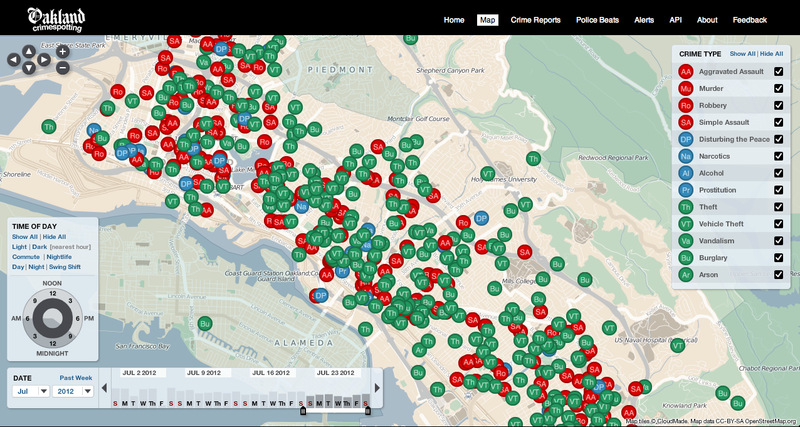 However, Oakland also has large swaths of territory that are incredibly nice, beautiful, generally safe, and free of violence and crime, much like the neighborhood where we lived, where, despite the occasional car stereo theft or house break-in, and one mugging several years ago, it felt very safe. However, sometimes we could hear the sound of gunshots echoing across the city, usually at night, reminding us that possibly just five miles away was a completely different world. image capture, but you get the idea. 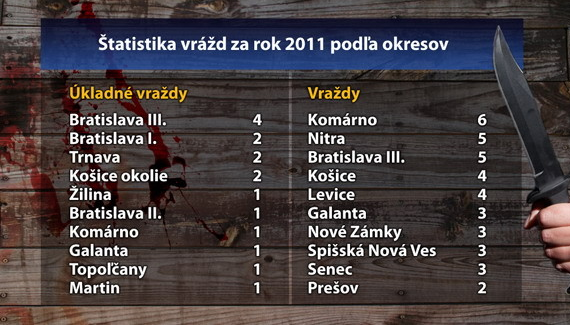 2011 homicide statistics for several different Slovak cities and towns. The day-to-day routine back "home" was seriously driving me to the brink of insanity. The repetition grew to be absolutely mind-numbing. There were times when waking up on weekday mornings required every inch of psychological strength that I could muster. The job at the Press, in particular, had become monotonous, despite working with some genuinely wonderful people and helping to put out some truly worthwhile publications. The time to shake things up was long overdue, and shake things up we have. I should mention that Terezia didn't mind her routine in the US so much, and being pulled out of it, away from the job and colleagues that she liked so much, was not easy for her. But with Terezia's newish job with the US ambassador and my new gig (that's right - more on that in a future post), we'll be settling into routines here soon enough. Yet it feels so liberating to have broken free of the old soul-crushing routine and to be doing new, different, and truly exciting things.